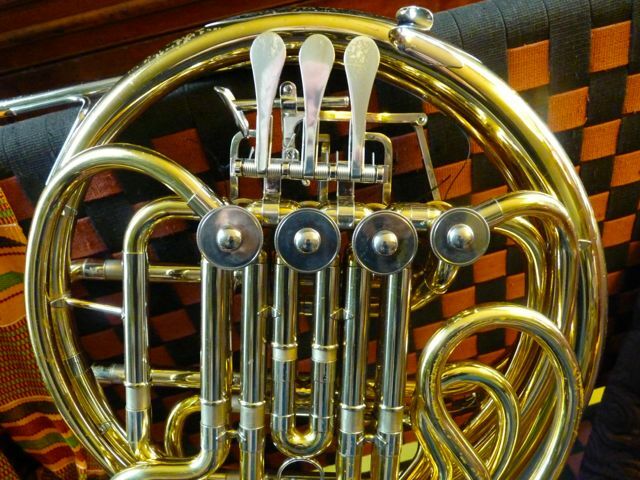 Listed the other horns I have for sale…. So lets start with a little guy. A Nirschl D-500 model. 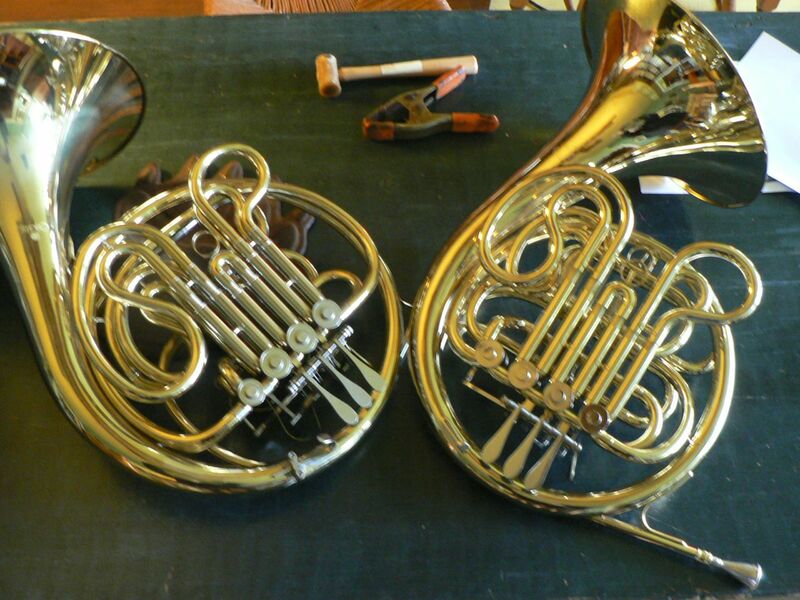 The one on the left is a Nirschl 3/4 sized Geyer wrap horn. String Linkage and tapered brass rotors. It comes in a nice fabric covered “solid” case with a front pocket which is large enough for music but not a Folio. The lacquer is 95% plus. 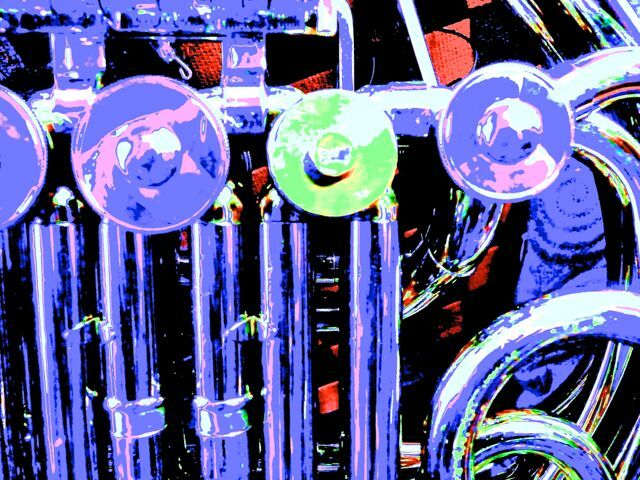 Its a full double, not a compensator, (which would be little lighter) set up for younger players, or someone who just wants a smaller horn. It also has an adjustable pinky hook and cool little spatula rubber tips, not shown in the photos. The one thing I’ll add prior to shipping is an Amado water key to the lead pipe. 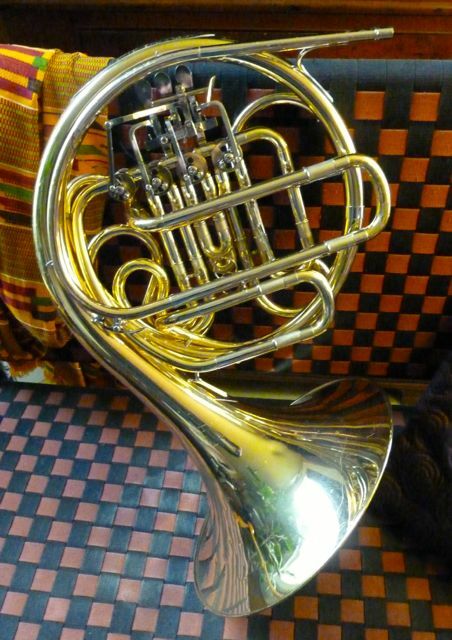 A Yamaha 567 double horn, serial # 046XX, This is a gently used horn. It has some lacquer loss and a couple of repaired braces. It has a rose brass lead pipe with a factory installed water key. 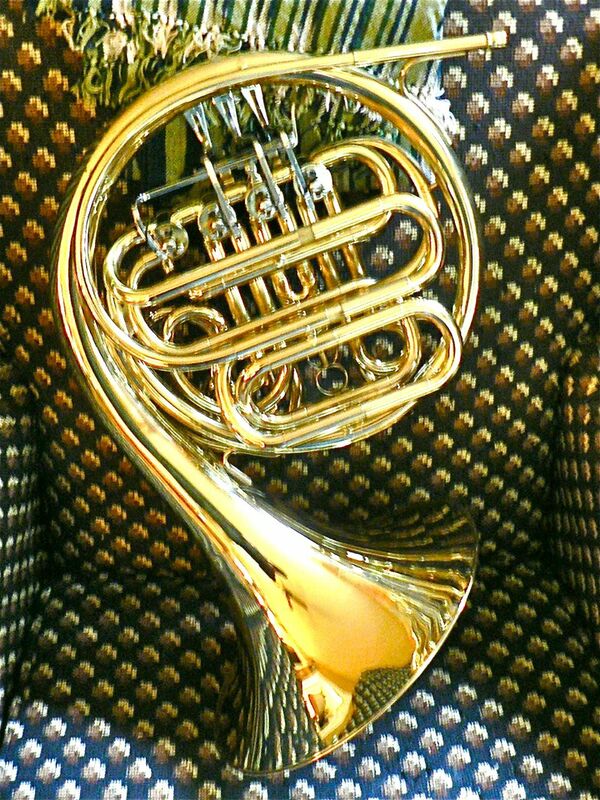 The horn is yellow brass, 93.45678% lacquer. (give of take a little). Plays very well. 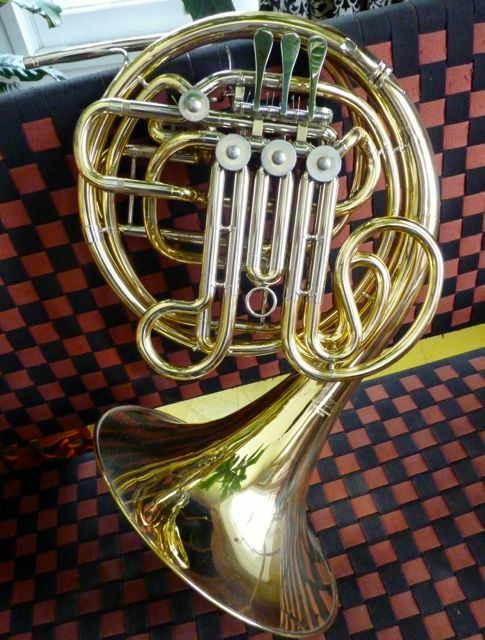 A Nice horn, in a black Factory hard case. No mouthpiece, (but if requested I can probably find something to suit the player). The instrument will be shipped following receipt of payment. Buyer pays shipping based upon the USPS priority mail calculator to your zip code. @ 20 LBS, 27″ X 18″ X 18 “ box. Cannot be shipped to countries with the 2m girth + one length postal restrictions. 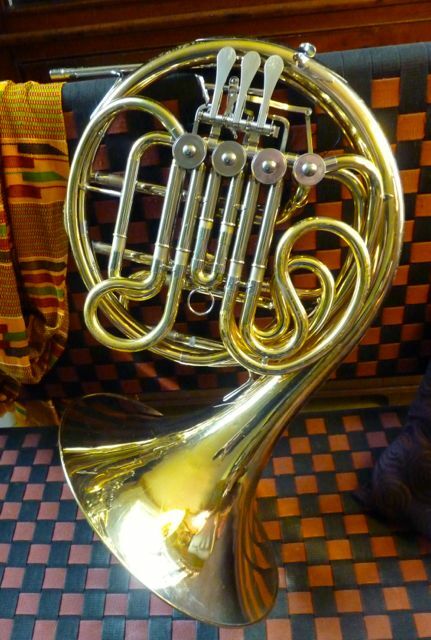 A Hoyer 5801 stencil horn.Kruspe wrap Accent horn is a Woodwind & Brasswind /VMI /Hoyer stencil Double French Horn. 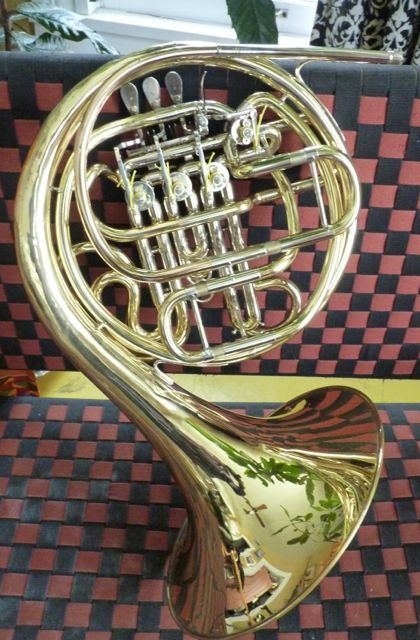 Serial #386779L It is a terrific horn for a serious young and, or university student. Yellow brass, lacquered. Gold Brass lead pipe. Nickel inner, outer slides and ferrules, String linkage. Adjustable pinky hook. 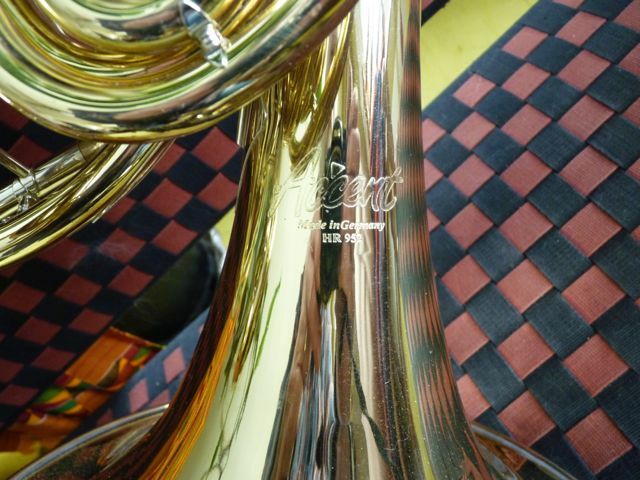 This Horn is free blowing, well centered, and has a big open sound; the tone color is characteristically that of a brass horn, with warmth and color that a nickel horn lacks. 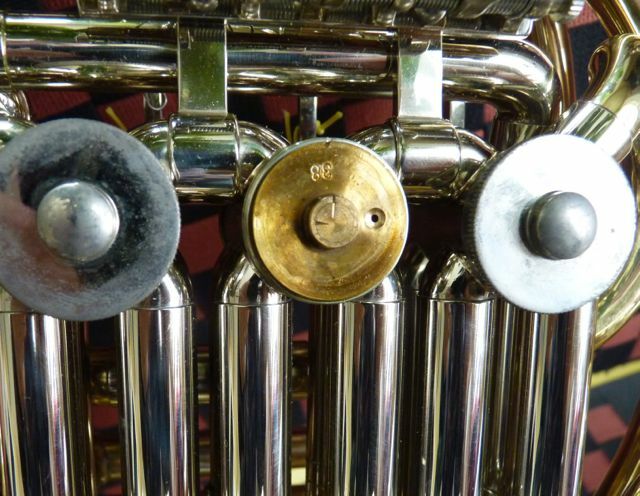 This horn uses the same valve cluster with Oil Ports and the bracing and bends are all the same as the Hoyer 5801 Kruspe wrap horn. Bore: 11,9 mm (0.468 “), bell diameter: 310 mm (12.205”) bell, adjustable pinky hook. 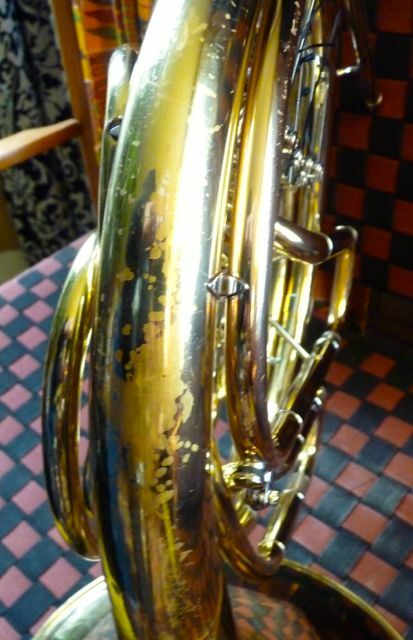 This horn is in excellent condition, Some signs of dent raising in the hand-grip area. A Nickel hand grip is not present. I’ll put one on if you so choose. I’ll also install an Amado Water key on the lead pipe if you so wish. String Linkage and articulated thumb linkage. 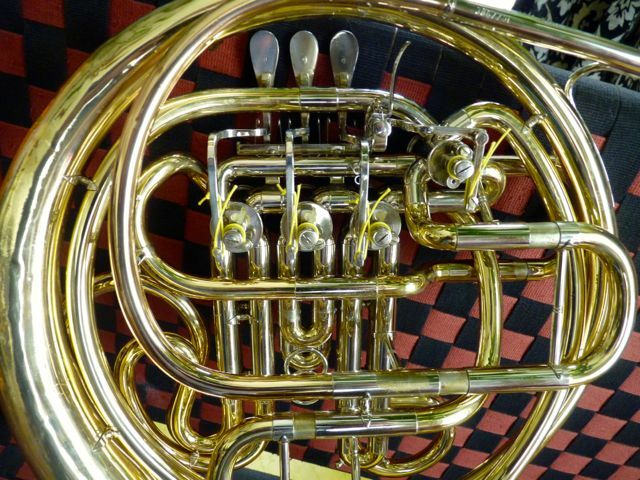 This horn was manufactured in Markneukirchen Germany, the same factory where the famous Hoyer horns are built. 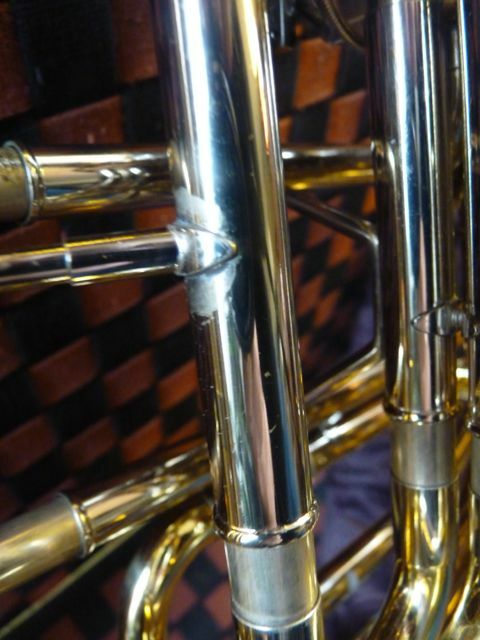 Today this factory features high technical standards, a large environmentally clean plant, and state of the art processes engineered especially for manufacturing brass instruments. 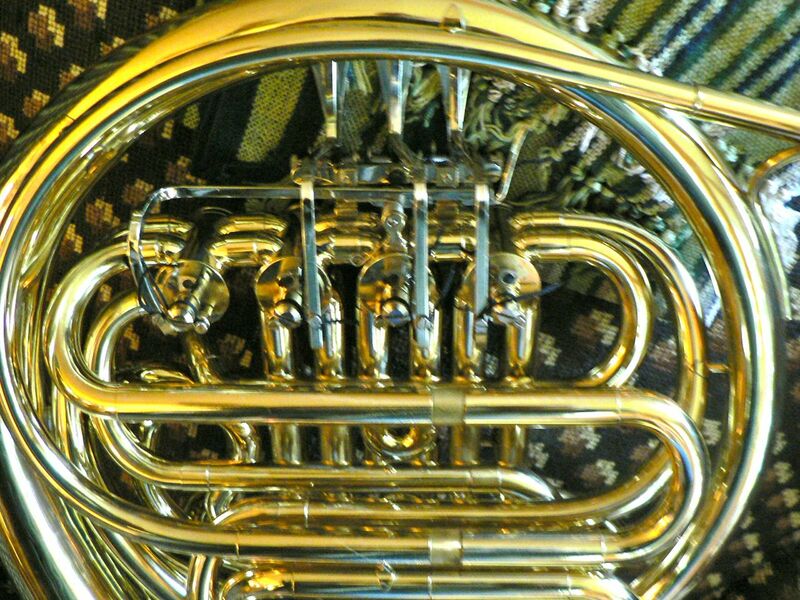 The horns are very consistent in quality. Brand Name Accent, a stencil name from the VMI/ B&S/ Meinl conglomerate sold by Woodwind/Brasswind in South Bend, IN is not to be confused with the current WW/BW ‘Accent’ horn which, today, is built-in China. Comes in a semi rigid cloth-covered case with generous side pocket for music and accessories.. 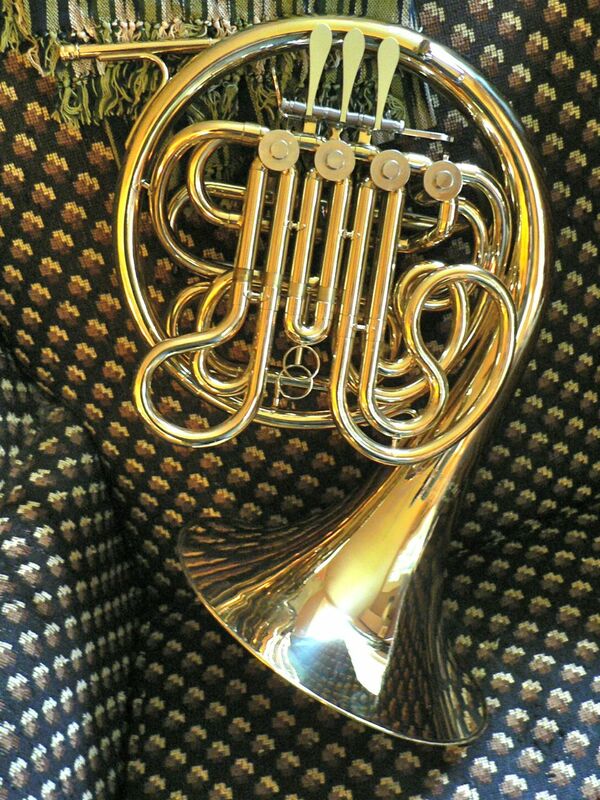 The horn will be shipped via priority mail in an 18″ X 18″ X 27″ inch box @ 20 Pounds, insured. 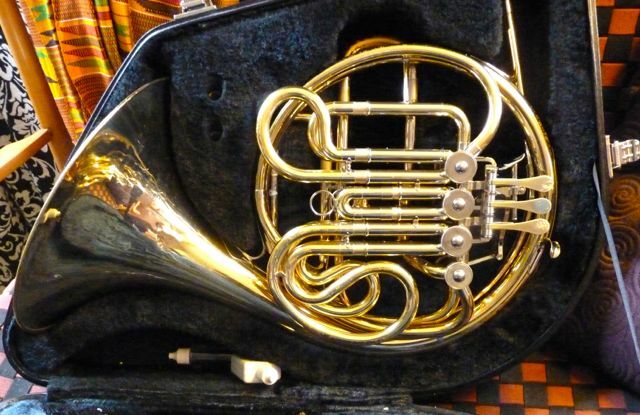 The cost is based the USPS price calculator, which you can access to determine fees to your address or country Because of the Box’s size this horn cannot be shipped to foreign countries with a 2m, 79 inch, girth plus one length limit.